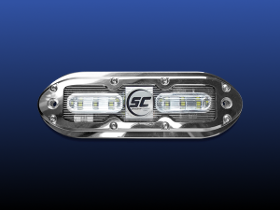 Shadow-Caster SCM-6 is a single color LED underwater light that comes in 5 vibrant colors. Bimini Blue, Ultra-Blue, Aqua Green, Great White, Cool Red. It produces up to 1,500 lumens of light while drawing a measly 2.1 amps of current at 12 volts. LEDs are tough but they still need protection from being wired backwards, high voltage spikes, and overheating. 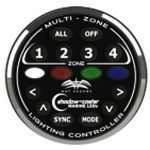 Shadow-Caster has you covered with built in circuits that protect your lights.